Play the role of an action-adventure hero. Smash spies, fight crime, defeat criminal masterminds and more. Enter the world of hard-boiled detectives, cloaked vigilantes and globe-spanning adventure. Become a daredevil. In this game you become the hero. You think for him or her and use your character's skills to solve the problem or overcome the obstacle at hand. These problems and obstacles are developed by a referee (called the Games-master). He or she arbitrates all situations using both the rules and personal judgement. DAREDEVILS is a game of action, adventure, and imagination. Your character is a hero. A cloaked avenger, a technological wizard, a hard-boiled detective, a reckless soldier-of-fortune. . . Each is a possibility. You can draw upon the great pulp magazines, the old movie serials, classic radio programs and even modern films set in the period. DAREDEVILS provides full rules for creating your hero. . . His or her attributes, skills and gear. Optional rules allow for the special powers and high-technology gimmicks used by many of the prototype heroes. Provision is even made for the uncanny luck of these redoubtable protagonists. The rules for DAREDEVILS are your gateway to action and adventure. New comers to role-playing games will find helpful hints on good play. Experienced gamers will find a selection of advanced and optional rules to add on to the basic rules for increased complexity and detail of simulation. 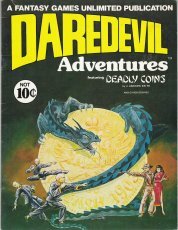 Herein is also contained a separate booklet, DAREDEVIL ADVENTURES, which presents several scenarios. Each situation is designed to introduce various aspects of the rules as well as provide a period flavor and a full dose of excitement. You may solve a murder, embark on a globe-spanning adventure, or become embroiled in the plans of an insidious mastermind. 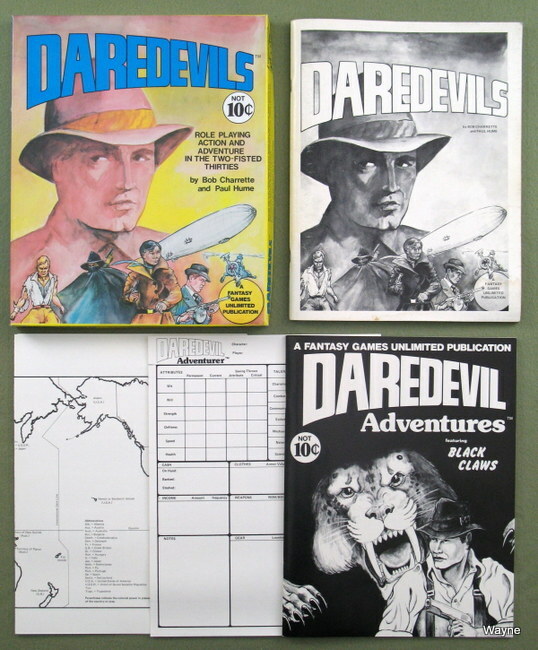 The DareDevils boxed set contains a staple bound rulebook, a staple bound scenario book, a cardstock character sheet, and a 3-panel cardstock reference sheet. The rule book is entitled DareDevils and is 64 pages long. 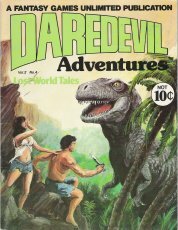 The scenario book is entitled DareDevil Adventures: Featuring Black Claws and is 31 pages long. The cardstock character sheet is printed on both sides. The 3-panel cardstock reference sheet is also printed on both sides. One side depicts a map of the world showing the 1930's political boundaries and a 1930's calendar. This reference sheet also makes a decent set of GM screens." A contract from a mysterious millionaire is a ticket for adventure in far places. Double-dealing, danger, and death may await the daredevils as they face the unknown and attempt to capture it alive! Death for a few dollars more? Hardly. Sudden violence dogs the path of some curious coins in the seething streets of Hong Kong. Just knowing about them can mean death! The daredevils uncover a trail of tenuous clues that will lead them into a confrontation with the evil Doctor Ling. We had finally found the professor's secret lab, It was pretty musty in there and April griped about the smell. Still, we had a mystery to solve so she carried on like a real trooper. There were tables full of scientist type stuff and a couple of weird machines. I didn't know what any of it was but then, I didn't have to because Murray was there and all that kind of gimcrackery was right up his alley. He seemed at home as he prodded and pried. It was beginning to look like our intrepid band wouldn't have any need of my specialties when a door suddenly banged open and a shadow fell across the room. Despite April's stifled scream, I figured she was just startled and I'd only have to take care of some hired gorilla or two. I turned to the doorway and saw that I had chosen my words better than I had thought." "THE SECRET OF TAHKA HIVA by William H. Keith, Jr. It should have been a simple job, really more than a lark of work, but the drone of an engine where none should be was the herald of danger. It was just the beginning of a hazardous flight for life. 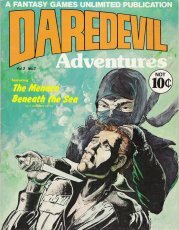 Deadly Japanese assassins can now be a part of you daredevil adventures. This section includes background and details concerning these black-clad figures of the night. As a special bonus, developed Ninja characters are provided to include in the adventures in this issue and/or to stimulate the creation of other adventures by creative gamemasters. The evil Doctor Ling returns as he attempts to further his plot involving the Nine Stones of Uighur. Can the daredevils breach his stronghold? Can they defeat his minions? Can they do it in time to save the world from Ling's insidious plan? Find out in this sequel to 'Deadly Coins'. His breath rasped from him in ragged gasps. The underworld tore at his clothes and flesh. His feet slipped in the mud beneath the brackish water. How many days had it been? How long since the disaster? He didn't know. His own noise covered the sounds of his pursuers. He stopped frequently to listen. Yes, they were still there. Still dogging his trail as they had for days. How many days? How long had it been? He didn't know. He was nearing the end of his endurance. Soon he would slip and they would catch him as they caught the others. Then, with freedom gone, his life would soon follow. How many days? How long? He didn't know, but he would soon find out." It seemed like a routine case. Determining why young Arnold McCoy had been killed. But, why and how had his body vanished from the morgue? Why weren't the police cooperative? Was there more to this case than met the eye and did it involve the mysterious curse on the Montique Water Diamond? Things seemed placid in Northview while the daredevils search for some missing pages from a manuscript by a highly- regarded novelist of the occult. Taking on this job for a prestigious publisher is one thing, even when it involves travel and a nagging side question. Dealing with what seems to be happening in this particular rural New England town is another thing altogether! Can the daredevils unravel the various mysteries here and will they do it in time to block catastrophe? 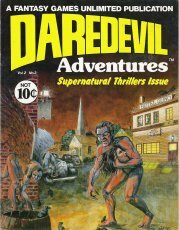 A frightened young woman comes to the daredevils for help. Her life is being threatened through letters and ads placed in the daily personal columns of the newspaper. Can the daredevils stop her killer in the short time remaining until the threats are carried out? Is there more to this case than surface appearances? The tires squealed their harsh protest as the car sped along the docks. Its driver gave a quick glance behind him and cursed silently as the pair of bright lights rounded the corner after him. He brought the car through another tight turn and desperately fought to keep it from sliding off the pier and into the icy waters of Big City Harbor. With a thunderous crack the windshield splintered as a slug flew through it. He glanced over his shoulder in time to see the other car begin to rapidly make up ground. Wiping his forehead, he let up on the gas pedal, pressed down on the clutch, and shifted the car into a higher gear. The warehouses rushed past him like a continuous wall. Suddenly his vision clouded and an image of an unknown gray haired man glared at him. He shook his head, rubbed his eyes and noticed a blur out of the corner of his eye. A car . . . a man leaning out . . . a gun . . . flashes . . . he felt the cold embrace of the harbor." An expedition explores the unmapped regions of Peru in quest of the legendary Inca stronghold of Cusichu. Can the Abercrombie expedition reach Cusichu before the rival Jourdan expedition and will they really be able to find any remnants of the Inca stronghold with only legends and fuzzy aerial surveys as a guide? Having found Cushichu, will the Abercrombie expedition find any evidence that the lost city is indeed the Inca stronghold used by El Espectro in his war against Spanish conquistadors? What was the fate of the Inca warriors and their leader? Do the old Spanish documents only relate the ravings of a madman? What other secrets can be unearthed as the ruins are explored and legends become truth? The exploration of the lost city leads to the secret escape route known to the Incas. What will be found in the lost valley beyond Cusichu? Can the ravings of the Spanish survivors of their expedition against Cusichu have been based on fact? The exploration of the Lost Valley will reveal the truth behind the Spanish reports, though it may still appear to be madness! This photograph, taken by a member of the Abercrombie Peruvian Expedition, shows James Stuart posing with what he claims is a brontosaurus which he shot and killed outside the Abercrombie camp. Experts agree that the fuzzy object behind Stuart is probably a large rock. Brontosaurus become extinct some seventy million years ago. Also in this issue is a conversion system for use with JUSTICE INC. from Hero Games. FGU and Hero Games shall attempt to cooperate to make the various adventures both published for Daredevils and Justice Inc. usable by players of either game system. JUSTICE INC. is a trademark of Hero Games and is used herein with permission."